While I will probably always remain an omnivore, I’ve been trying to eat more vegetarian meals. Tonight we went with a black-eyed peas & cilantro/lime salad, roughly inspired by a Saveur recipe, that came out really nicely. 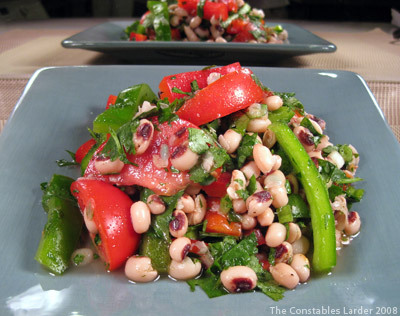 Soak your black-eyed peas overnight or for several hours during the day. Cover with water in a pot with half a yellow onion and bring to a boil. Lower heat and cover, letting simmer for about 30-35 minutes or until tender. When done, remove onion, drain in a colander and cool by running cold water over the peas. When fully drained, add to salad bowl. Remove seeds from your green and red peppers and chop to desired style (I chopped them up about 1.5 to 2 inches long, 1/3 inch wide), then add to bowl. Take a very large handful of fresh cilantro and loosely chop, removing any excess stalk, then add to bowl. Take a handful of flat leaf parsley (discard the stalks) and more finely chop, and add to bowl. Cut 2 medium tomatoes into eighths, and add to bowl. De-seed a hot jalapeno pepper, then chop and add. If you don’t have access to fresh jalapenos, a handful of pickled jalapenos loosely chopped will still work well. Squeeze the juice from 3 fresh limes over everything. Add 4 tbsp of extra virgin olive oil (that is a guess — it could have been more since I never really measure my olive oil amounts; really you should do it to your own taste). Mix up your salad, but try to be gentle so that you don’t mush up your peas. Let it sit for 15-20 minutes so that the peas start to take on the flavor of the lime and olive oil. Add salt and freshly ground pepper to taste. I found that I used more salt than I normally use in a greens-based salad, so add salt carefully as usual, but be prepared to taste and add more. We served this with Presidente beers (a Pilsner-style beer from the Dominican Republic). While I didn’t think of it at the time, some lightly toasted pita bread would also make a nice accompaniment. P.S. this keeps overnight in the fridge really well (possibly even better) since it all marinates together. Gregory Triana, co-owner of the fabulous kitchen and dinnerware supply store Blue Cashew in High Falls, NY (warning: dangerous store to wallet), sent me this wonderful vegetarian black bean recipe. It definitely takes some time and attention but is worth it. Given my carnivore tendencies and my inability to leave a recipe alone, I have started dabbling with adding chorizo or beef to it to good effect, but so far I think the original vegetarian version below is the best. I usually just make 1 pound of dried beans, and therefore cut the amount of garlic, but have played with keeping the cumin, green pepper and onion portions the same, also to good effect. Thank you to Gregory for letting me share this here. Mix all together — Gregory likes to use his hands but spoons work as well. Fill the pot with water about 1 inch above the bean line, cover and soak overnight for at least 12 hours…. Cook uncovered for about 2 1/2 hours…. Skim occasionally and stir – check the water line never let it dry out and check bean tenderness. If you need to add water it must be warm. Discard the bay leaves and remove the vegetables and place into a food mill most of them do not worry if you leave a few behind. Add some liquid of the beans and a few beans to create a nice paste- remove from your food mill and add back to the pot…. Add some fresh cracked pepper – to taste. Final Step…. Making the Sofrito! Remove from heat and add all contents to the beans that are still cooking at low temp. Continue to cook ur beans for about another hour low heat – covered. Gregory’s Notes: You’re basically done… The beans should be tender, the broth a bit thick and ur done… Set aside serve and eat or store in the fridge. Black beans should always be served with long grain white rice – but we sometimes use a kashi rice or brown but never yellow!